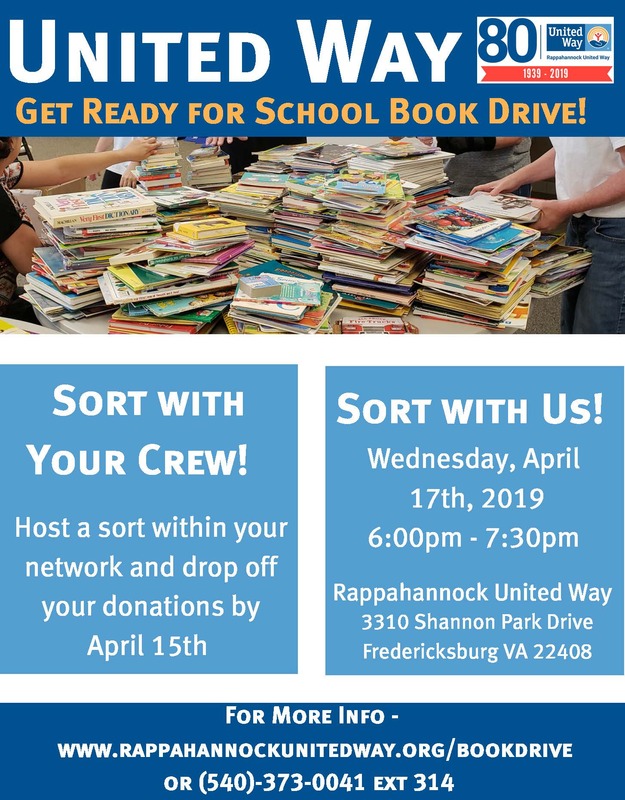 Rappahannock United Way is excited to be hosting our second annual Book Drive, Sort-a-thon and Reading Days! We’ve turned Spring into a season of giving & learning, and we’d love for you to join us as we help prepare Head Start students for Kindergarten and as we put summer reading books into the homes of kids throughout our area. How can you join in the fun? It’s easy! • Host a book drive at your workplace, in your neighborhood, or with your civic group. RUW has customizable flyers you can use to spread the word! Donate books by dropping them off at RUW’s office by April 15th (off Rt 2, between Wawa and Shannon Airport.) Saturday drop off is an option. Join us at our Sort-a-thon on April 17th as we sort books by reading level and get them ready for the kids. We’ll be visiting local classrooms during the last week of April and would love for you to join us! If you’d like to learn more, please visit http://www.rappahannockunitedway.org/bookdrive. Sign up on that page and we’ll be in touch with more details. Thank you for supporting reading & learning in our area!